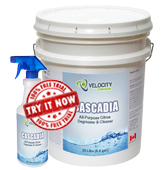 CASCADIA is an all-purpose water-based citrus degreaser and cleaner. It is used to clean various soils, including tar, asphalt, fuels, greases and oils. Also, it can remove ink, glue, crayon, gum, rubber marks, lipstick, mastic and other adhesives. Heavily-Soiled Surfaces – apply full strength at ambient temperature as a pre-soak chemical, followed by the application of steam or high-pressure water. Light Cleaning – dilute product up to 1:20 (5%). Let sit for 3 to 5 minutes and rinse thoroughly with water. If necessary, rinse with pressure washer for hard to remove soils.